The term “red-brown alliance” refers to political collaboration or synthesis between fascists and radical leftists. Such alliances strengthen the far right, spread ideological poison and confusion among left-minded people, and are disastrous for building liberatory movements. Fascists have been pushing red-brown politics for generations – sometimes openly, sometimes by repackaging their ideas to sound leftist. Unfortunately, sections of the left have repeatedly gone along by forming coalitions with far rightists or offering platforms for far right propaganda. Principled leftists have criticized this dynamic repeatedly, for example with regard to anti-Gulf War activism, the anti-globalization movement, Occupy Wall Street, and leftist media. However, the problem has continued and in some ways arguably has gotten worse. “[P]olitical confusion [specifically referring to far right conspiracist ideas presented as left wing analysis] is dangerous as it serves as recruitment for fascism, which is obvious in how...the American neo-fascist movement is explicitly aiming to attract leftists by using anti-capitalist rhetoric, and how sections of the so-called ‘anti-imperialist Left’ repeat the same positions as fascists, for example concerning Syria, Libya and Ukraine, while remaining in denial about this fact and labeling all criticism of their reactionary positions as ‘McCarthyism’. As corollary to the above, Vagabond emphasizes the importance of opposing both “the nationalist and colonialist ideology of Zionism” and the racist ideology of antisemitism – including hatred and scapegoating of Jews that is presented in the name of anti-Zionism. 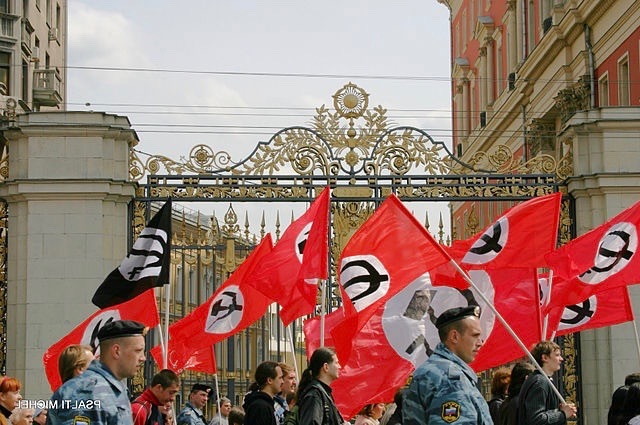 “Red-Brown Alliances” begins with historical background on “some lesser known forms of fascism” that advocated an alliance with the Soviet Union or a synthesis of anti-capitalism with antisemitism and other far right themes. These included National Bolshevism and Strasserism in Germany of the 1920s and 30s, Francis Parker Yockey in the 1940s and 50s, and the origins of the European New Right and Third Positionism in the 1960s and 70s. 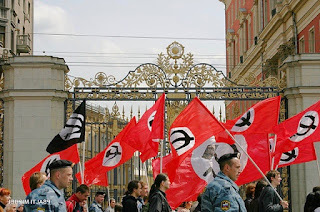 The report continues with sections on Duginism and other fascist currents centered in Russia, the Lyndon LaRouche movement, Syrian far right groups such as the Syrian Social Nationalist Party and Mussalaha, and conspiracist organizations such as the Voltaire Network and the Centre for Research on Globalisation. There is extensive documentation of researchers and activists who have been featured on leftist media yet have far right politics. The last part of “Red-Brown Alliances” focuses on leftist organizations (such as Workers World Party and its offshoot the Party for Socialism and Liberation) and ostensibly left-leaning individuals (such as Ramsey Clark and Cynthia McKinney) who have long patterns of making common cause with fascists and other right-wing authoritarians in the name of anti-imperialism. “Red-Brown Alliances” includes an extraordinary amount of information, and I can’t evaluate all of its statements, but for topics on which I am knowledgeable nearly everything rings true. For example, the report includes an unusually rich and nuanced discussion of the LaRouche network, noting its shifting uses of racism, complicated relationship with the Russian far right, and ripple-effect influence through former members (and still active conspiracists) William Engdahl and Webster Tarpley. On Ramsey Clark, the report doesn’t just detail his decades of support for LaRouche and other far right figures, but also notes that as U.S. attorney general in the 1960s, Clark set up coordination between the FBI’s COINTELPRO and the CIA’s own illegal domestic surveillance program. In recent years, red-brown politics has often taken the form of far rightists and sections of the left converging in support of, or collaboration with, Russian President Vladimir Putin’s government, policies, and international allies – notably the government of Syrian President Bashar al-Assad – because they clash with U.S. and western imperialist interests. Three Way Fight has addressed these convergences in the past, for example here, but Vagabond does so far more systematically and in greater detail. “An Investigation into Red-Brown Alliances” is an important work that deserves to be widely read and discussed on the left. It has already been picked up by some other leftist sites, such as libcom.org. For supplemental links in English and French, see Tendance Coatesy blog’s useful commentary. Thanks to John Garvey for alerting me to the “Red-Brown Alliances” report. By Psalti Michel - 9 May 2006, CC BY-SA 3.0, via Wikimedia Commons. Image has been flipped to display flag emblems more clearly.